So, we’re home. As I mentioned last week, the beach week with my fam was full of fun and laughter, but was also filled with sleepless nights (thanks to listening to TWO babies fussing throughout the night since Owen and his cousin Becca were rooming together), and sickness (Owen had en emergency trip to the doctor on our way out of town which revealed an ear infection and – yup! – another upper respiratory infection that required breathing treatments every 4 hours at the beach, and I subsequently got a yucky cough and then pink eye because I was unable to take care of myself and sleep). Owen pretty much recovered throughout the week and although I’m still nursing my pink eye, we’re pretty much on the up and up. And did I mention we’re HOME? Like, to our new house? Our new house that we have “lived in” for 2 weeks but only spent 5 whole days in? Yes, that house home. Coming home to a bunch of boxes and a bit of disorganization was not the most relaxing homecoming, but it certainly feels nice to be home for good. My mom and little sister came and spent the night prior to leaving for the beach, and my brother and sister-in-law and their 6 month old baby came up to visit on their way home from the beach, so we were able to get a bit more unpacking done while my family hung out with Owen. 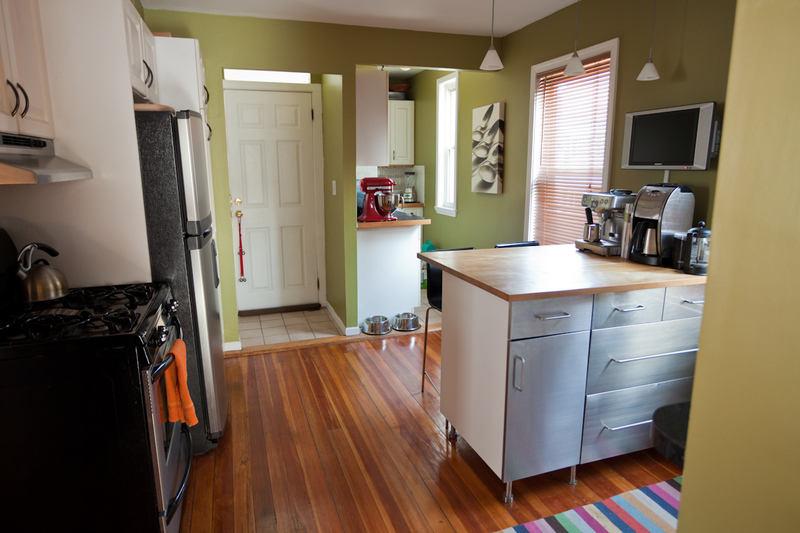 The kitchen, living room, dining room and bedrooms are completely unpacked and organized. We’re not exactly ready to start putting art up on the walls, but we’re doing pretty well! 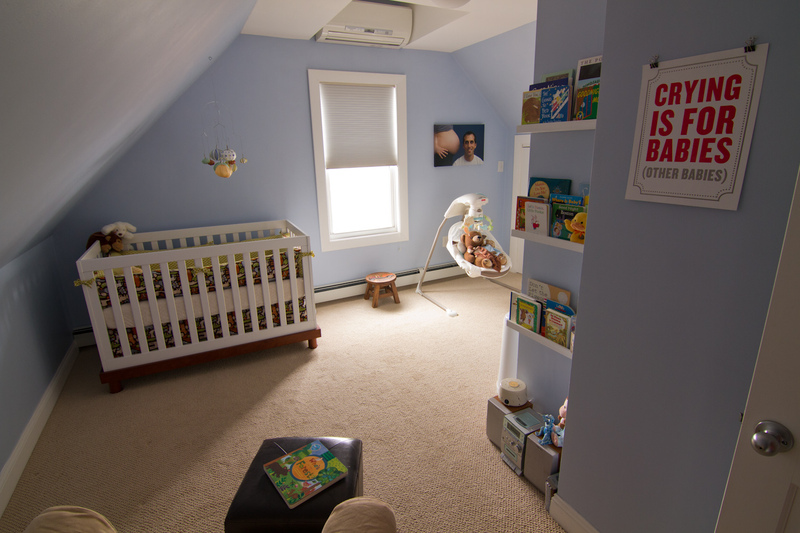 Owen is LOVING his playroom (which is about 2.5 times bigger than his entire nursery in our old house) and sleeps like a champ in his new nursery. He didn’t really have any sort of adjustment period to the new house; he just kept his old schedule and took it all in stride. What a flexible little boy. Ah, sick baby days. I have missed you! (Ahem… NOT!). The whole This Place is Now a Home family has been healthy for the last few weeks (following our unfairly long bout of sickness after sickness), but I fear that we are entering the realm of boogers again. 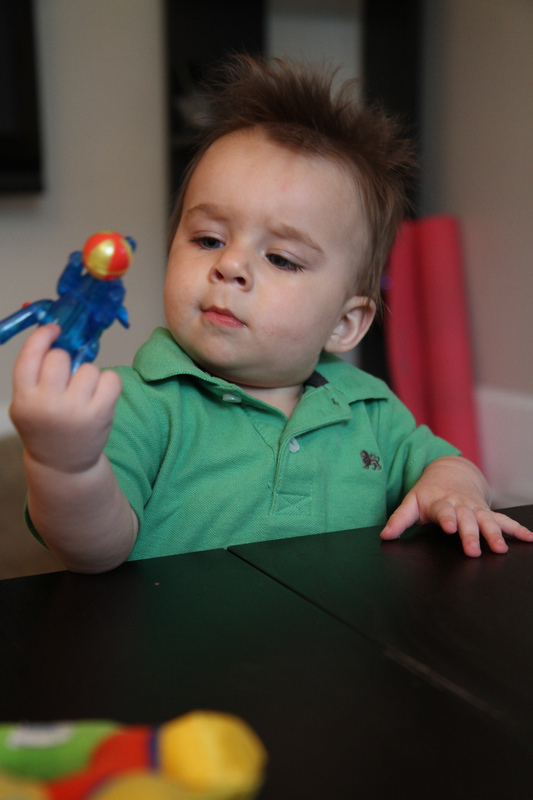 Owen has had a low-grade fever on and off for the last few days, along with an unprecedented amount of boogers. This morning when he woke up, in fact, his little face was so covered in dried green snot that I actually carried him into our bedroom to show his face to Benjamin before I cleaned him up. Nice, huh? I’ve been using the boogie sucker, wiping nonstop and using a humidified at night, but the boogers just keep coming. My throat is beginning to feel a little sore and Benjamin is starting to feel a little congested as well. I guess that was bound to happen; we’ve been going a mile a minute for the last few weeks, gearing up for the big move, and we haven’t exactly been getting lots of sleep. We’re loading up on the vitamins and doing our best to keep this sickness at arm’s length. 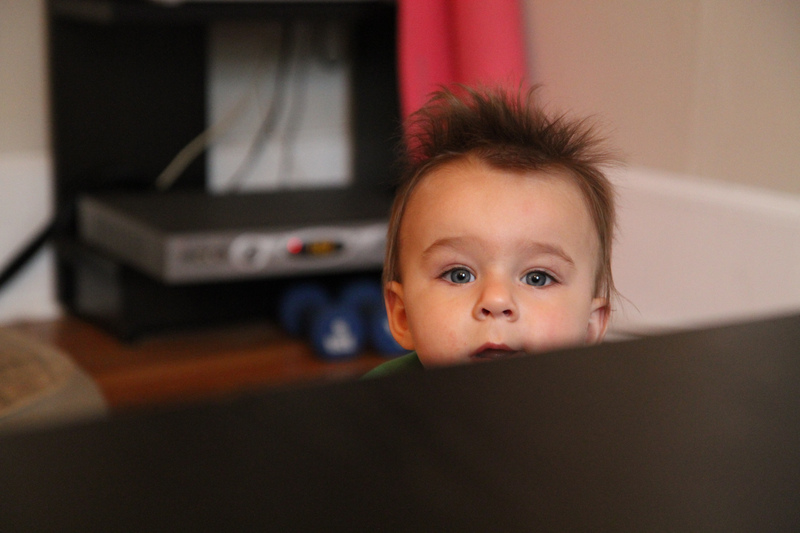 Oh, and Owen’s STILL working on those top two teeth that have been threatening to pop through for the last 2 weeks. I think I see the tips coming through the gums, but the boogers compounded with the drooling is enough to fill a bathtub. Yuck. In other news, our new daycare doesn’t start for a few more weeks, so we’re stuck driving Owen back into the city before we go to work each day, which is a HUGE HUGE HUGE pain and takes several hours out of our day. Hours that I would really, really rather spend unpacking. But c’est la vie. We’ll get unpacked eventually. Send us healthy vibes so this boogerfest doesn’t turn into anything worse? Well, we’re here. The move day went as well as could be expected (though move days are never “smooth”, right?). We woke up as normal, woke Owen up, and Benjamin took apart his crib (the last piece of furniture standing in our whole house) while I gave him a bottle. We wanted to try to minimize disruption to Owen’s schedule as much as possible, so I drove him, Schnitzel and a carload of breakable things out to the house after his morning bottle. That means Benjamin was left to do all of the last minute packing, directing the movers, and cleaning. Yikes. Bonus points for Daddy. So being the obnoxiously organized person that I am, I had a list of all the things I needed to put in a last-minute bag to take with us to the new house that morning (you know, the important stuff like diapers and my cell phone and the all important lovey). It was packed and ready to go when we said our goodbyes to the old house and headed off for the new. Only one problem. It was still sitting in our old bedroom while I drove away. Mayjuh oops. So I arrived at the new house with a single diaper that (thankfully) had been stuck in my purse at another time, no wipes, no lovey, and no cell phone. Since we haven’t gotten cable/internet/phone set up in our new place yet, I was in a technological black hole with no way to hear how the progress was going at the old house or when the movers would be on their way to the new house with all of our stuff. Mommy fail. I changed that one diaper as strategically as possible in order to have it last until reinforcements arrived. The weather felt like summer and I took Owen and Schnitzel outside in our new yard. Schnitzel pranced like he had just won a lifetime’s supply of treats in the doggie lottery (it may still be a small yard in most peoples’ eyes, but it’s a HUGE improvement from our old yard! ), but Owen was not so sure about this weird green stuff sticking out of the ground. I put his little feet into the grass (which he has never really touched… that is a testament to the weather we’ve been having and a sad side effect of living in the city) and immediately he curled them up, refused to stand, and burst into tears. Poor city baby doesn’t know what to do with nature! That will change quickly, I hope. 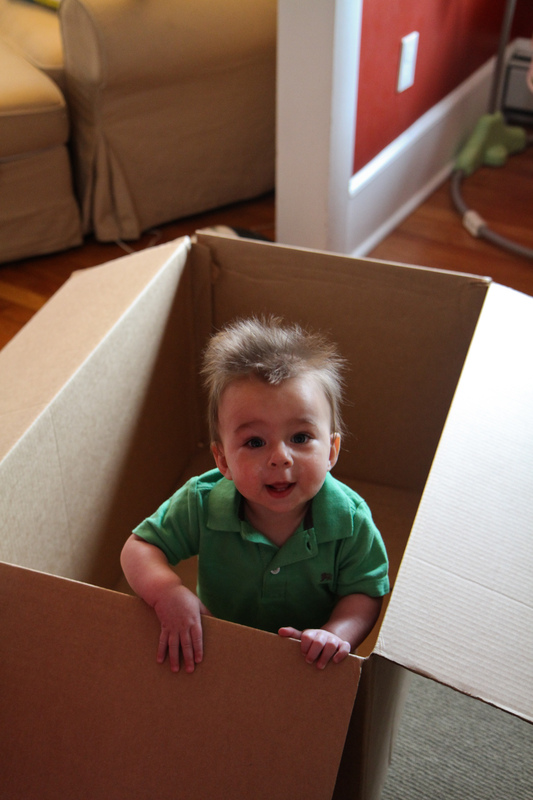 Finally the movers arrived and I bounced Owen around while we directed them. Master bedroom! Master closet (more on this later — there is a whole ROOM designated to the master closet)! Basement! Office! Kitchen! Now all we have to do is unpack. 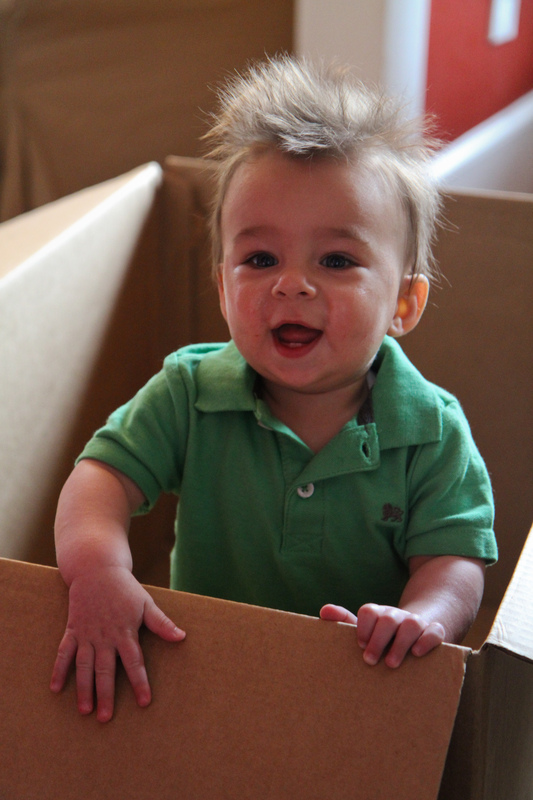 With a wriggly toddler intent on eating everything we pull out of a box. And working full time. Hmmm. Anyone want to come over and help? I know we’re not moving for three more days, but recently my mind has been filled with all of the wonderful memories we made in our current house and how, slowly but surely, it transformed from our first house into our first home. As I pack boxes of our furniture and clothes and shoes and take the pictures off the walls, I know we are going to see all of them again once we open up those boxes in the new house. We’ll set up the rooms with the same couch and tables and chairs. We’ll hang the same clothes in our closet. Turn off the same lamps before we go to bed. But it won’t be the same. As excited as I am to move, I can’t help but feel a bit sad thinking of leaving this home behind. It’s kind of like a first love. I’ll think back on it fondly, remembering all of the good parts and none of the bad. I don’t think I’ve ever told you the story of our engagement, but for this post the only important thing about it is that it happened during my senior year in college. That’s right, I was a baby. A baby majoring in architectural studies, totally obsessed with design of all kinds, and yearning for my own house to renovate/decorate/redesign. As soon as that ring was on my finger, I we began dreaming of the day when we would have our first house. 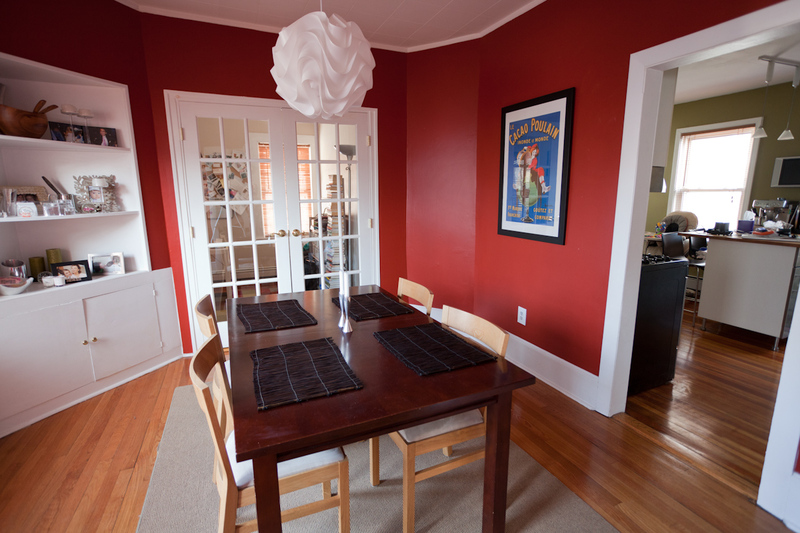 We bought the 100 year old house shortly after I graduated (aka before we were married — gasp! ), and our love affair began. I asked Benjamin to think of some of his favorite memories in our house and was surprised to see that the first one on his list was one I don’t even really remember. That, like so many other once-precious moments, has gone the way of the dinosaurs in my brain. Tucked behind other, newer things, like Owen’s dimpley grin and how his chubby feet squirm when I tickle them. The first memory on Benjamin’s list was coming home mid-afternoon on the day after our wedding and falling asleep together on the couch, surrounded by wedding presents. While I may not remember that particular nap (sweet as that memory is), I do remember opening each wedding present as it arrived and finding a “home” for each gift and realizing, little by little, that we were doing more than just playing house. I remember trying on my wedding dress and my veil in front of the mirror and knowing that THIS was the place I was going to come back to with my new husband. There is something so wonderful about having the house before our wedding; it feels like having an old friend who has known you your whole life. I cannot even begin to count the number of hours of sweat equity we put into this house over the last 6 years. We painted and scrubbed and scraped and tore down and built up and painted again and laid tile and used tools we’d never used before and painted again. We stayed up until all hours of the night painting by the light of a single lamp. Our friends helped us build a fence around our backyard, fueled by a few cases of beer and a pneumatic nail gun rented from Home Depot. We ripped the entire top floor down to the studs and built it back up again so that we could have a nursery. 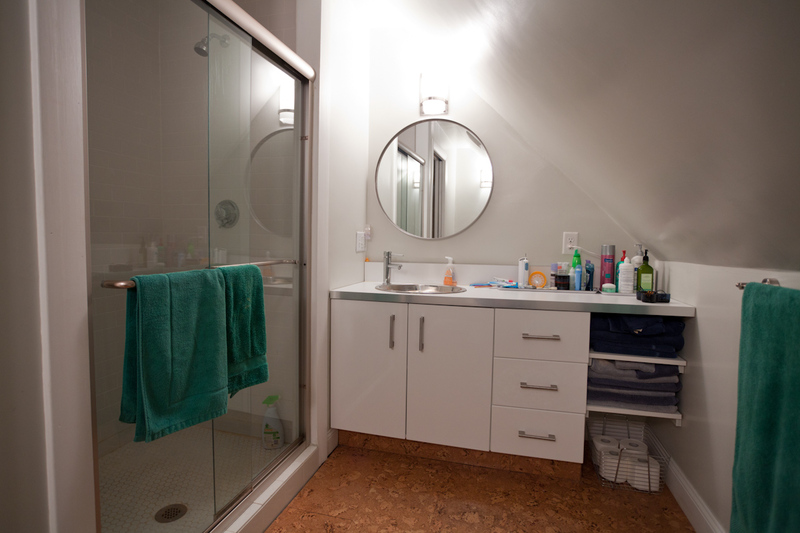 This house expanded to make room for the most important project of all. Most of the projects turned out pretty well, but with a few warts. Evidence to the fact that aside from our enthusiasm and watching a lot of HGTV, we really had no experience in this department to speak of. That was the beauty of it all. The messing up. I won’t miss all that painting, though. If these walls could talk, they’d probably also tell some stories of pretty awesome parties we threw (back in the day). I love to entertain. I love the planning and the cooking and the setting up. I love getting all of our friends in one room and having that room be in my house. Every New Year’s Eve we used to have a party complete with an ice luge on our side porch. Ahhh, how times have changed. Do you know what we did this past New Year’s Eve? Neither do I. I think we both fell asleep super early. No party. And definitely no ice luge. (Don’t get me wrong — my midnight nursing session with my favorite little boy was all the party I needed this year!). I remember the day that we brought baby Schnitzel home too. He was SO TINY (which is amazing to think about now, because he’s easily taller than Benjamin on his hind legs and about 75 lbs heavier than he was that day), just 12 weeks old. We carried him up the stairs and set his oversized puppy paws on the wood floor and let him run around and sniff everything. Immediately, he peed. On the kitchen floor. That night he slept in his crate beside our bed and his sad whimpers, calling for his brothers and sisters, broke our hearts. I spent the whole night with my hand dangling over the edge of the bed with my fingers in the crate so he knew I was there. We tried (and tried and tried and tried) to make a baby in this house. And then we finally did. That, by far, is my favorite moment. I grew that baby in this house. Waddling, with my basketball-sized tummy, up and down the stairs and dreaming of the day that I would carry a baby in my arms. And then one day I got to do that too. I know it’s not the house that matters, it’s the memories. But it’s pretty amazing how one place can hold so many of the most important moments of your life. Double digits, my tiny man. Double digits. You are officially 10 months (and 1 day) old. 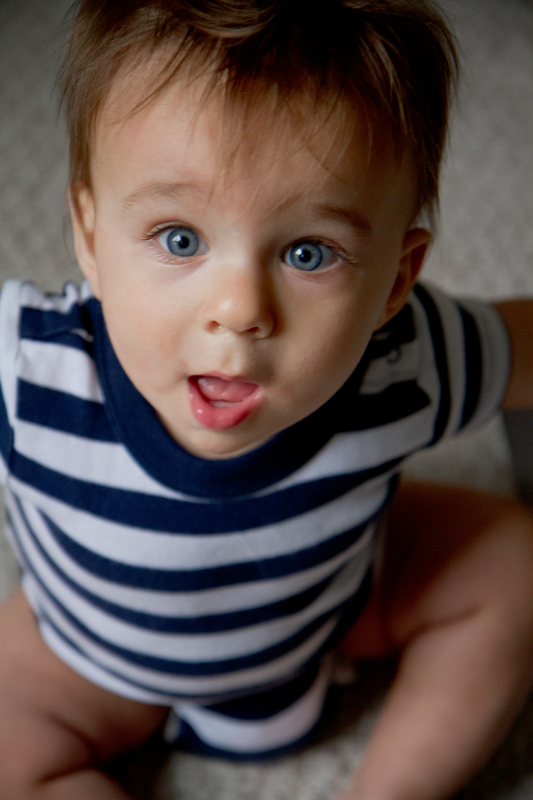 All of a sudden it seems like you are speeding toward being 1 year old. Why 10 months feels so much older than 9 months, I’m not sure. But it does. And though I feel like it was just yesterday that I saw your sweet, tiny face for the first time (time really does fly), it’s also totally, totally amazing to think of all you’ve done and how you’ve changed since that day. These days you are a moving machine. 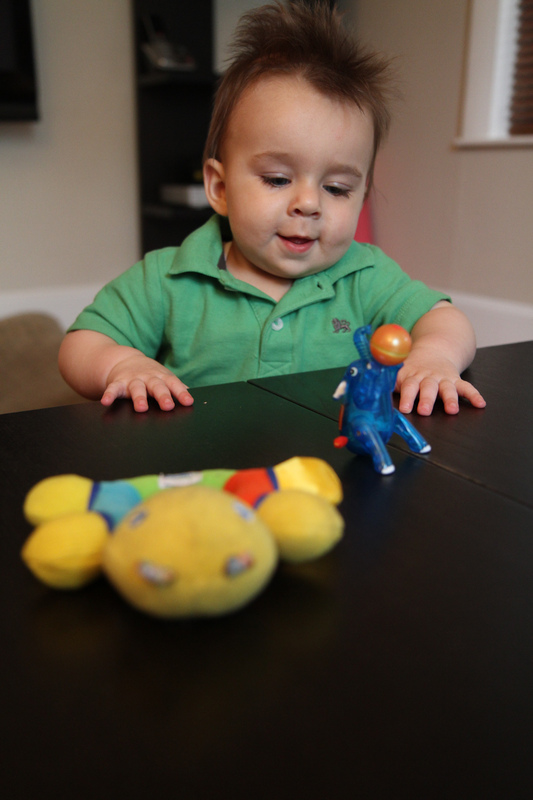 A tumbling, crawling, toddling, cruising, grabbing, rolling, reaching moving machine. You are not satisfied unless you are exploring; usually holding tightly to my fingers as you barrel forwards, head first. 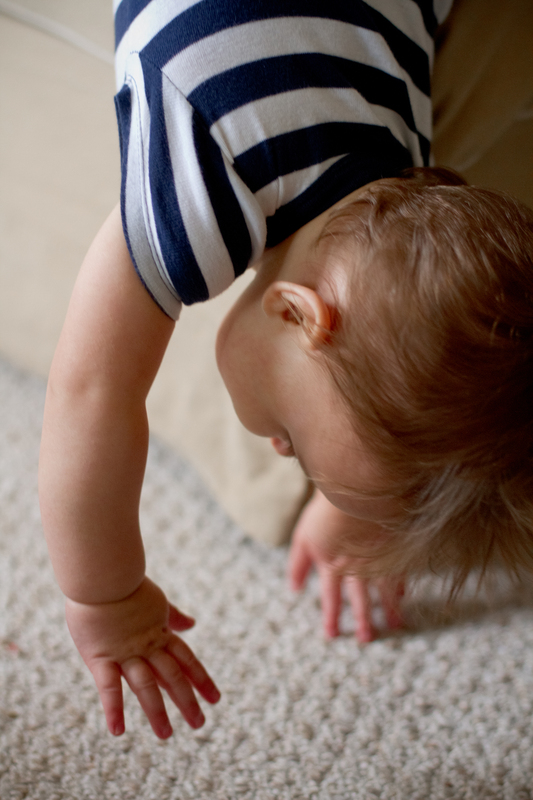 Sometimes you go faster than your little legs can handle and you face plant into the floor. Most of the time you don’t even care and you scramble right back up and keep on moving. 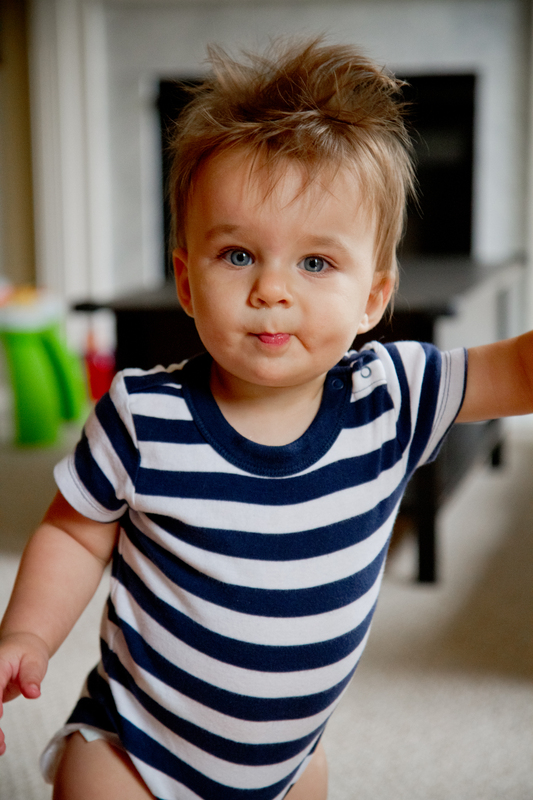 I can already tell that once you take your first steps I’m going to be running after you forevermore. I can’t even tell you how exciting it is for me to watch you explore the world like you do. With mouth-open amazement and sheer joy. It’s written all over your face. Your twinkling eyes and dimpled smile are 100% contagious, and I can say without a doubt that you make me laugh more than anyone else in the whole world. Except maybe Daddy; he cracks me up too. Even with all of that exploring going on, there are these rare, sweet, quiet moments that we share. In the carseat while we’re driving and I hear you in the back singing a little song while thoughtfully examining your hands and fingers and toes. After you drink your bottle and you rest your head on my chest, babbling softly while you pat my cheeks and touch my curls. In the morning when I come to get you from your crib and you, warm, clean, cozy you, smile softly and rub your lovey on your face ever so gently. Those are the moments that I think my heart just might explode from loving you so much. Those are the moments I wish I could just stop everything and memorize every tiny detail. You may be a rambunctious little boy who loves to be thrown high in the air, but there is also a sweet, tender, quiet side to you that I hope never goes away. The term ‘gentle man’ is not an oxymoron. I hope I can raise you to be one. You’re in no hurry to get more teeth. Though I know you’re dying to try new, harder foods, you’re lacking something pretty important… top teeth. But man, those two little bottom teeth are adorable! I’ve been saying for the last 2 weeks that the top one(s) are coming in because you’re definitely teething again, but they seem to be taking their sweet time. I’m in no rush for them to come in, though, because somehow seeing those pearly whites makes you look less like a baby and more like a little boy. And although I want you to become a little boy someday, I’m trying to eek out a little while longer with you as my teeny tiny baby. Despite the lack of top teeth, you’ve been eating a lot of new foods recently! Now that I’ve figured out your eczema triggers (oats and wheat/gluten, that I know of) we’ve expanded your repertoire to include all kinds of unlikely baby foods, and your skin is clear and smooth. You tried turnips and turnip greens last night and you gobbled them up. Chickpeas (baby hummus) and scrambled eggs and gluten-free pancakes. Homemade tofu fried rice and sweet potato fries. 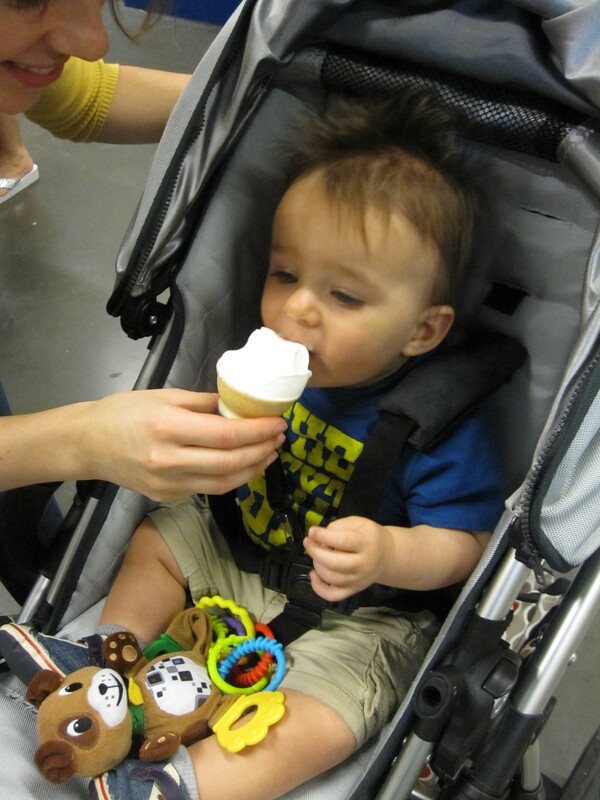 Even ice cream (you had a little taste on our recent trip to Ikea!). You just keep opening up your mouth like a little baby bird. Shovel it in, Mama! You still haven’t broken your “never refused a food yet” streak. 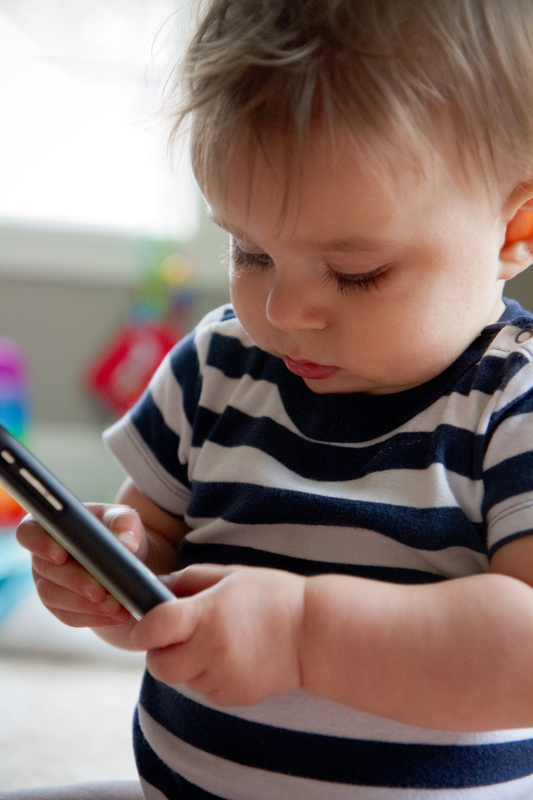 I’m keeping my fingers crossed that that trend continues, because I think we are heading into the picky eating stage as you enter toddlerdom. That’s one stage I’m going to have trouble dealing with, especially from you, my little vacuum cleaner. And now, onto our next big adventure as a family. WE’RE MOVING. I know you will never remember our first house, but I will always remember all of the important things that happened there. Like bringing you home and setting you on the porch and letting Schnitzel sniff your tiny body curled up in the carseat. I bust into tears at that moment, a mix of happiness, fear, excitement, worry, and just about every other emotion there is. We were HOME. With a BABY. I’m crying again just thinking about it. We made many memories in that little house, and although I feel emotional about leaving, I am brimming with anticipation to start our “new” lives together in our new house too. I can already picture you learning to ride a bike in our driveway and throw a baseball in our yard. We’ll have Christmases and you’ll pose for prom pictures there. It will be your HOME. I’ve said it before and I’ll say it again. You are a JOY. You are MY joy. You and Daddy are everything in the world that’s important to me. Every day I think of how lucky I am to have both of you. Nope, not Disneyland. Well, at least not for me. Err, not that I would know. I’ve never been there. No… better. Land of simple and smart design. CHEAP simple and smart design. Land of wandering through interior spaces and wanting to live there. My own personal Disneyland. You may think I’m joking. But I’m not. I LOVE Ikea. We needed a few key pieces for our new house so we set off on an excursion to go pick them up. 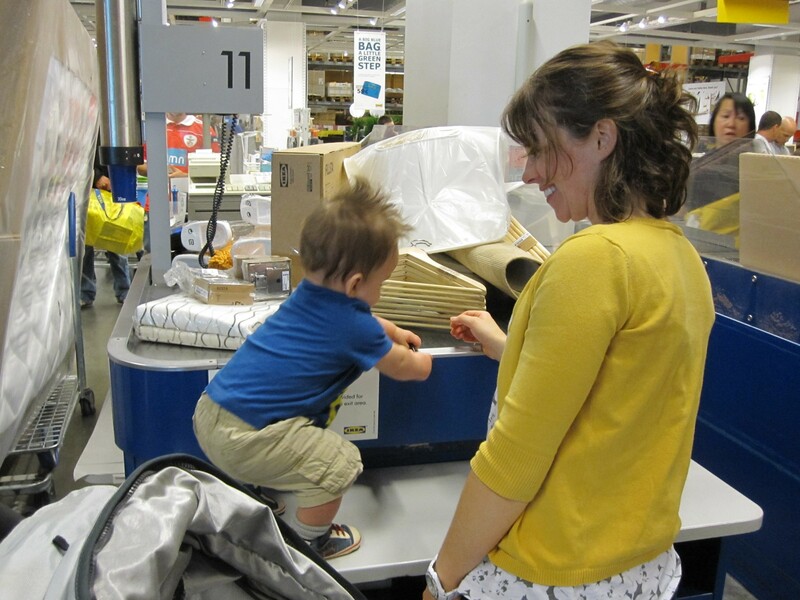 But anyone who has been to Ikea (especially with me) knows that there is no such thing as “running in and picking up one thing” at Ikea. It’s pretty much a day-long trip, what with wandering through the rooms and discussing design choices and examining products and drooling over all of the cheap things (that tend to really add up) in the Marketplace. Oh, and the meatballs. You HAVE to try the meatballs with lingonberry sauce. Divine. So we did something we rarely do (but this was an emergency!). It was our last weekend in our current house before we move, and it was our last chance to get any furniture we want to have at the house on move-in day. So we threw naptimes out the window and set off on our trip. Well, not exactly. We discussed doing that, and then I vetoed that plan and decided we should let Owen have his morning nap (his longest and most reliable) and then go after that. Lucky for us, Owen seemed to know that an Ikea trip was in his future, because he napped terribly and woke up early in a grumptastic mood, so it was the perfect time to plop him right in his car seat and let him finish his nap on the way there. Decent morning nap (x2)? Check. We brought the stroller so he would be comfy for our day of Ikea strolling, since I knew I could only keep him happy in a cart for so long. That was a great decision, as he was happy as a little clam for the entire day! Seriously, we couldn’t have asked for a better shopping companion. We even got our meatballs. 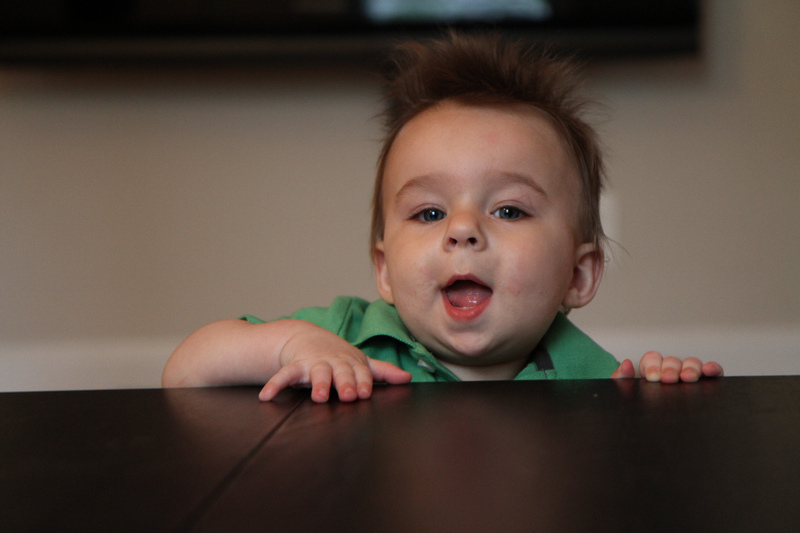 (Well, Owen had baby food that we brought with us… Benjamin and I had meatballs). Even the high chairs at Ikea are cute! The whole store is so family-friendly. I told you I love Ikea. Owen even had his first taste of their delicious vanilla soft serve. 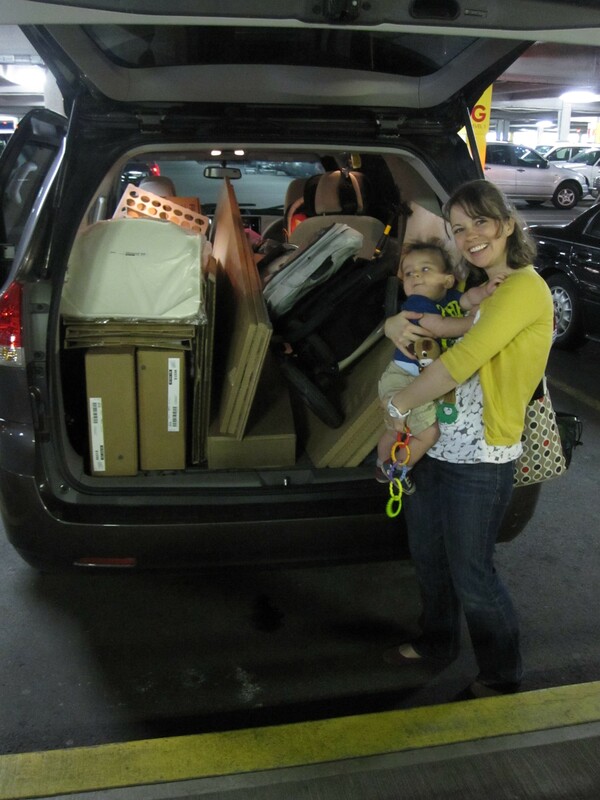 Then we loaded everything up into the car. 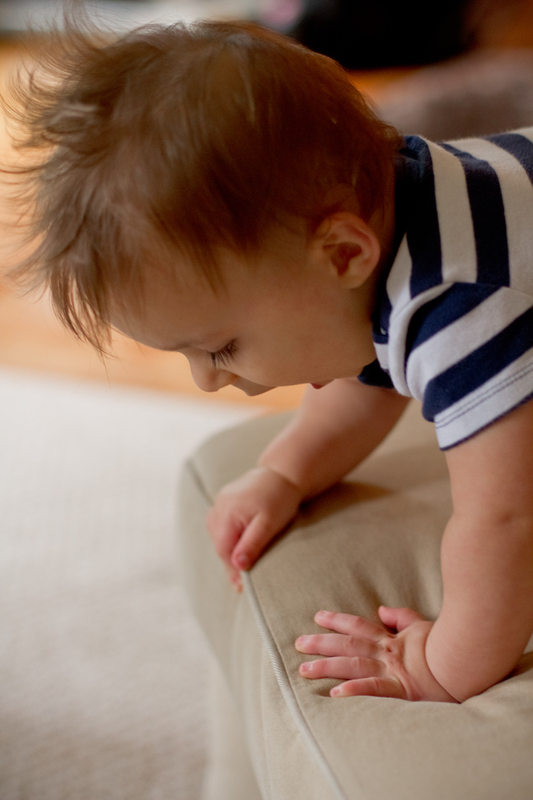 The little darling had been cooped up in the stroller for most of the day (except for a few times when I let him cruise along furniture in beautiful Ikea rooms), so I wanted him to have a little “playtime” before we got back in the car. 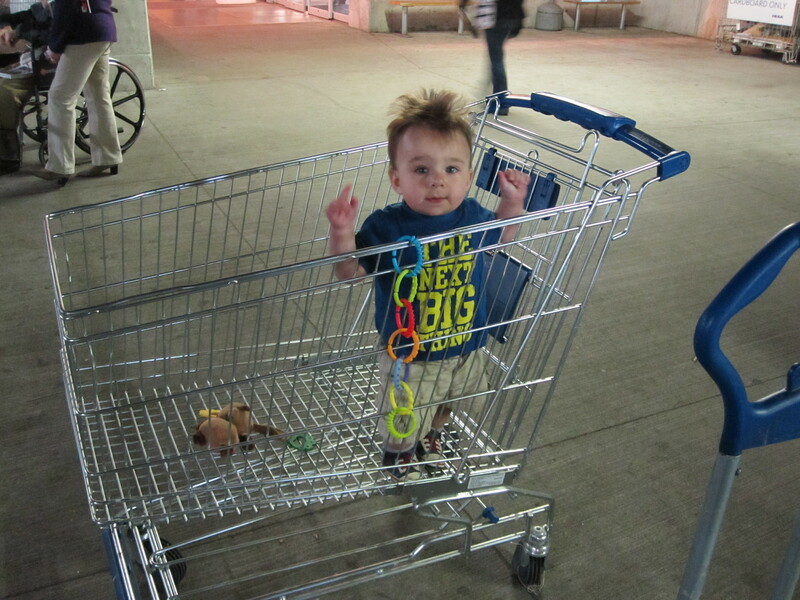 It was hard to contain him in the loading area so I popped him in our empty shopping cart. He was talking up a storm! See? (P.S. I know you are not supposed to leave a child “unattended” in the back of a shopping cart, but please know that Benjamin and I were only an arm’s length away and had our eyes on him at ALL TIMES). 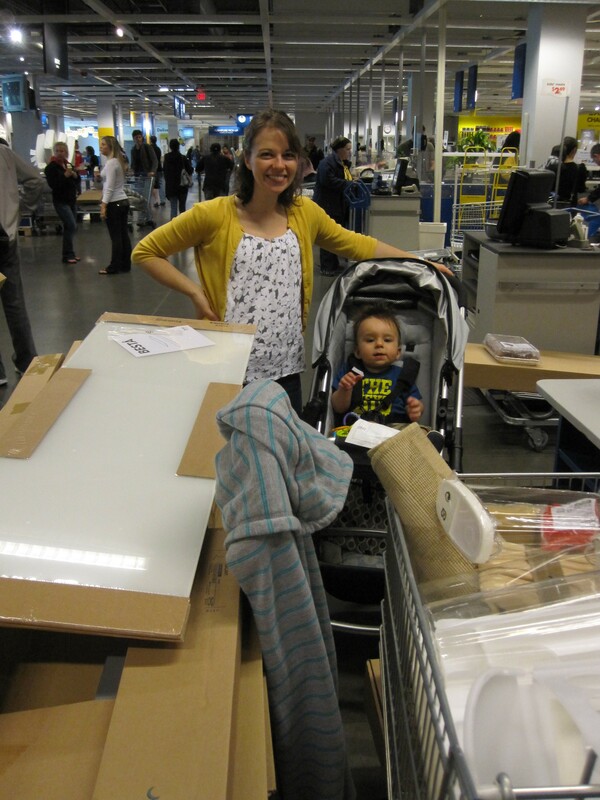 I think Owen loves Ikea just like Mama. He was an absolute angel this time around, but I fear the days of him being happy in a stroller for several hours are numbered. 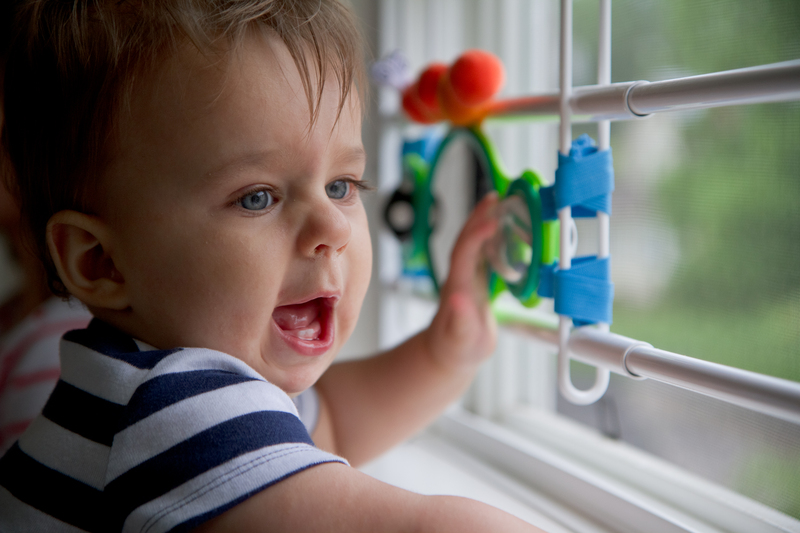 Any tips for entertaining little climbers when they need to be in a chair or stroller but want to be running around? Whoa. Two weekdays in a row without posting? Sorry, folks. Yesterday I headed to the new house and worked from there so I could meet with an electrician and a painter to get some things organized before we move in. 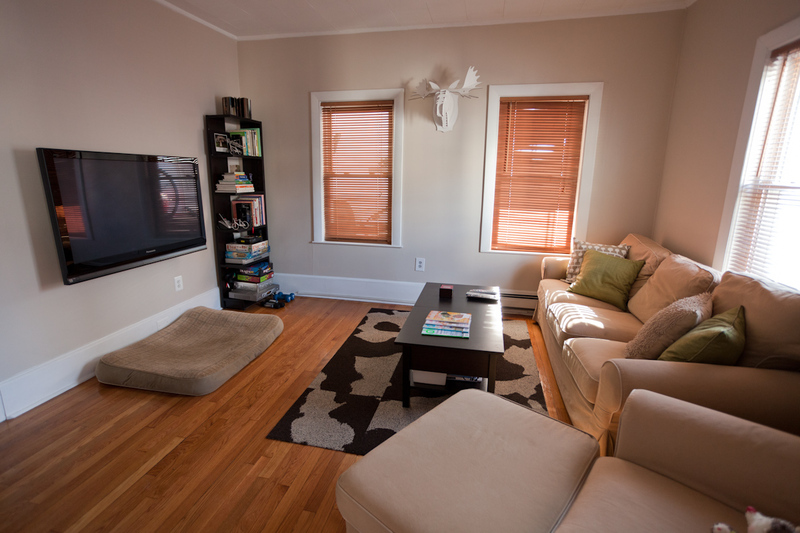 They were both SUPER nice and able to accommodate us before the move date, which is awesome. I could be wrong, be people seem nicer out here 🙂 In Boston I always felt like people like plumbers and electricians were pretty much just out to steal my money. Maybe these guys are too, but at least they do it with a smile. I brought Schnitzel along so he wouldn’t be at our other house alone all day. 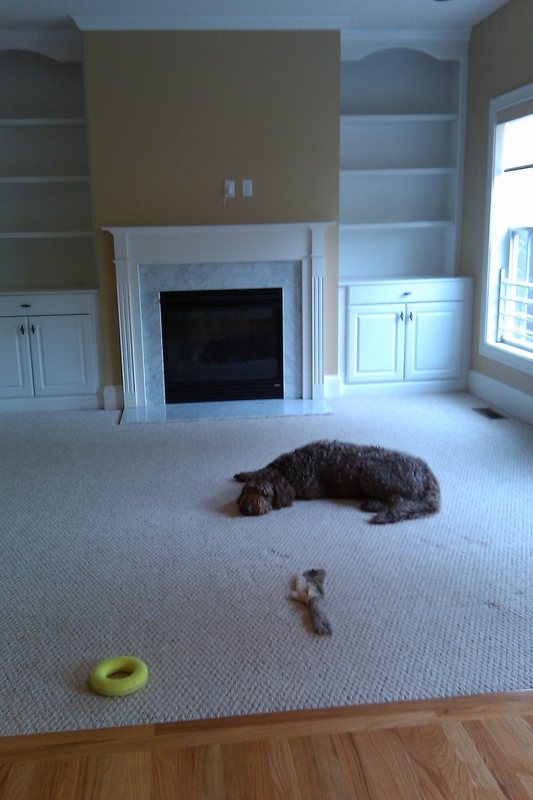 I wanted him to begin to get used to the new house as well. I’m sure we’ve written about it before, but it’s worth saying again… Schnitzel is a HUGE baby. He is the sweetest, gentlest, funniest dog, but he has more than his fair share of irrational fears. Maybe it’s the poodle in him — too smart for his own good. He’s scared of trash bags. I think it’s the way they move on their own when the trash settles. He’s scared of plastic bags blowing in the wind. He’s scared of the vacuum cleaner (we call it “Schnitzel’s Nemesis”). He’s scared of hallways with corners. If he can’t see the end of the hallway, he won’t go down it. Now, I realize this is very smart, actually, because it means he won’t get stuck in a dead-end tunnel. But it also means he won’t go down stairways that have a corner, like to a basement. Apparently he’s also scared of stairs that have open railings (and openings between the stairs, forget it). You know how I know? Because he won’t come upstairs in the new house. When we were looking at houses we used to joke “We can’t buy this house because Schnitzel won’t be able to go up/down the stairs”. When we found this house we thought he’d be fine; there’s a wide staircase with solid stairs. One thing I didn’t consider, though, is that the spindles on the banister are open, and I think he’s scared to go up because he can see straight down. Crazy dog. So yesterday when I went upstairs, Schnitzel waited (and whined) at the bottom of the stairs. I couldn’t get him to come up. Then this morning Benjamin and I were at the house comparing paint samples (more on that later), and we went upstairs and encouraged Schnitzel to follow us. Finally, after much cajoling, he came. He was shaking and cowering, but he came. 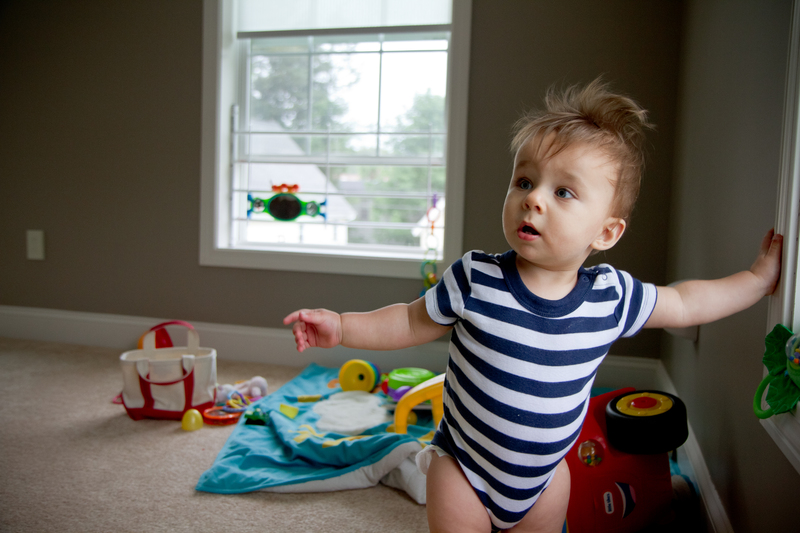 At the top of the stairs he ran immediately into the nearest bedroom (Owen’s room). 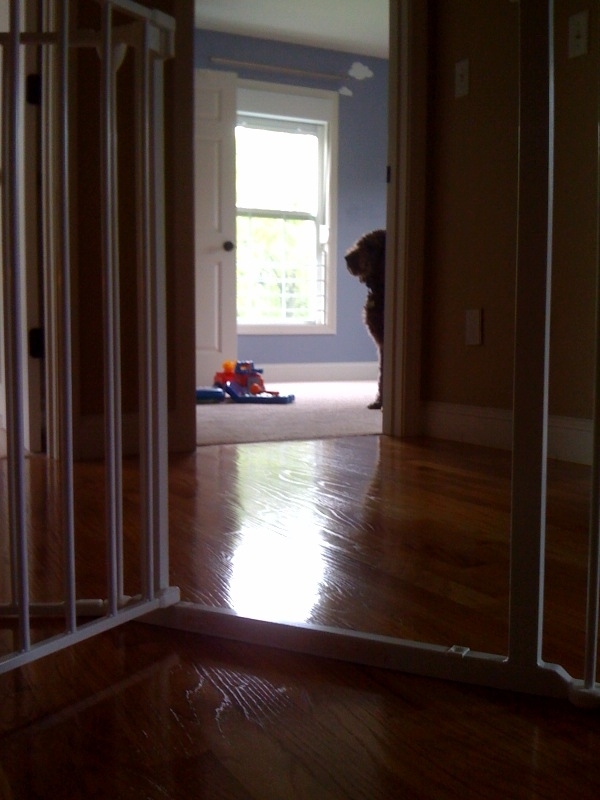 Once in there (safe on the carpet and out of the view of the open railing), he wouldn’t come out. We tried luring with treats, pushing, pulling, taunting, encouraging and ignoring. He stayed, frozen, in Owen’s room. FINALLY Benjamin thought of the one thing Schnitzel can’t resist. “Do you want to go outside?” Schnitzel paced back and forth and whined. Benjamin bounced a racquetball on the kitchen floor. After a pause we heard the click of Schnitzel’s nails and he stumbled down the stairs. Safe and sound. Now I’m not sure he’ll ever go back up there. Anyone else dealt with crazy pets and new houses? Oh, right, paint colors. Wanna see? The pictures are totally not the same colors, but you get the idea. 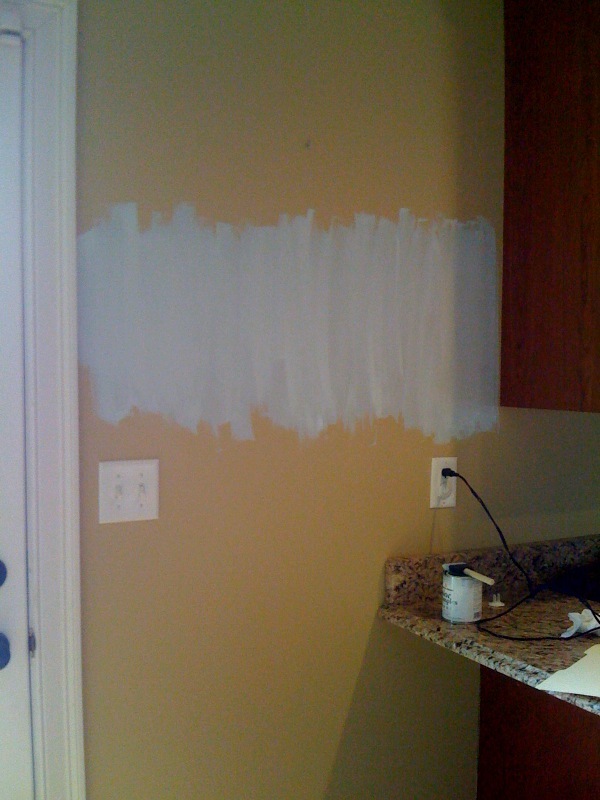 The kitchen is going from a sandy beige (which is most of the house) to a slate gray-y blue. Benjamin’s Moore’s Brittany Blue. 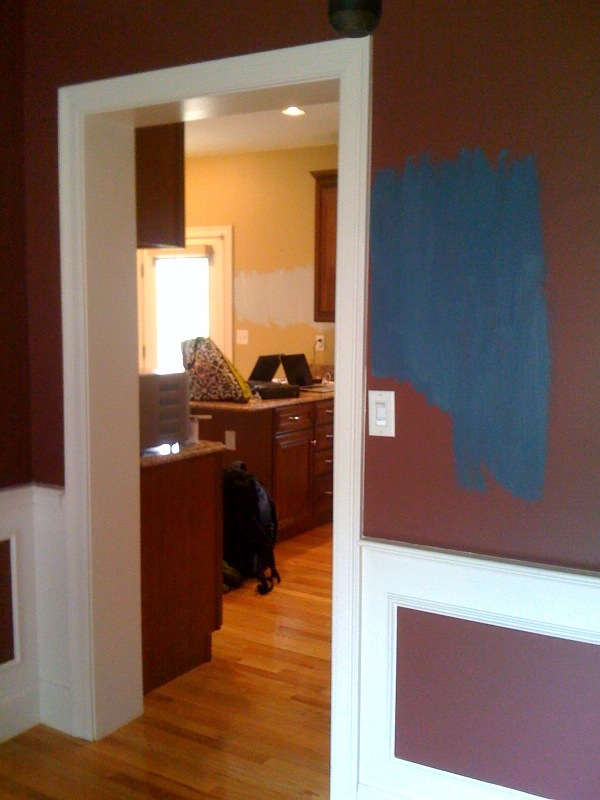 Dining room is going from wine-y purple-y red to navy blue. I’m totally in love with this blue color. 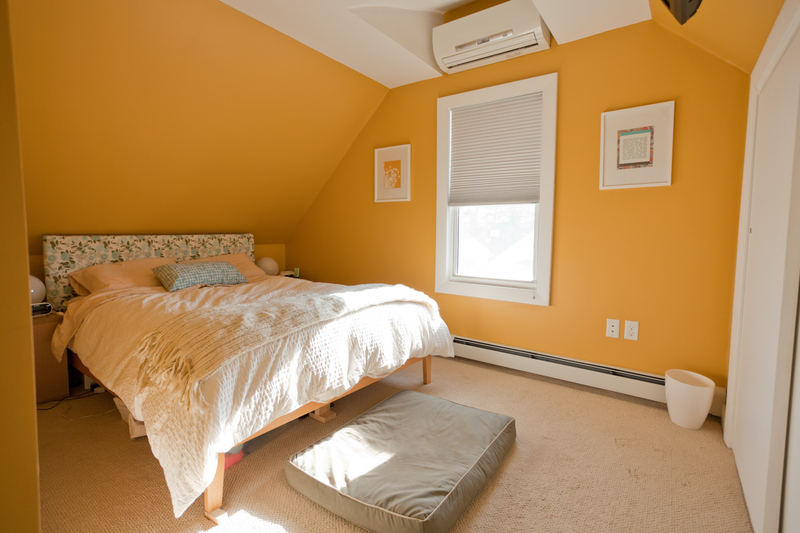 Benjamin Moore’s Spellbound. I know most of you haven’t seen our current house (maybe I need to do a little house tour before we leave for good! ), but we lurve deep, bold colors. More to come! We made some serious progress packing this weekend. Even Owen helped. And today we’re off to sign our names a million times and plunge into a massive amount of debt 🙂 Can’t wait! I’m mostly excited for the walkthrough prior to closing. It feels like it’s been forever since we last saw the house because we put the offer in waaaay back in February. We’re taking measurements and comparing paint chips and all that fun stuff. Yip yip! We decided to leave Owen at home today so we could concentrate fully on our important errand, so he is playing the day away with a babysitter. We have never really had a babysitter come play with him when he was awake (the few times we’ve had one at all we’ve had them come after we put him to bed). I know, I know, we’re lame. Given the little bit of stranger anxiety/clinginess we saw the other day, we did a “dry run” with this babysitter this weekend and had her come for a few hours to play on Saturday while we got some packing done. It was a win win! Now I feel like she and Owen are buddies so he won’t mind when we’re gone today. I’m in that blissful, naive state where I feel like we got so much packing done this weekend that we could move tomorrow if we had to. Cough, cough. The logical part of me KNOWS this isn’t true (we still have an entire basement we haven’t touched, along with all of our clothes and lots of things we left out because we might need them in the next 2 weeks), but I’m going to live in denial until next weekend when our next round of superpacking happens. We’re not expecting really any packing to get done during the week since between work and daycare and playing with Owen and sleeping there are only a couple “free” hours each night, and most of the time they are taken up by cooking, cleaning up, and spending quality time with my husband watching a tv show. Next weekend I’m sure I’ll be totally overwhelmed by how much we have to do again. For now, my thoughts have turned to all of the phone calls and appointments that need to be made between now and then: cable/internet/phone, gas/electric, painters, wallpaperers, plumbers, oh my. Not to mention all the things we’d like to buy in the next few weeks: TV(s), dining room table & chairs, coffee table, curtains, lighting, the list never ends. Wish we could move in right now so we could get started! Whoa. You know that To Do list I always talk about? The one I’m usually pretty good about checking things off of? Yeah… it’s creepin’ up on me. As in, I feel like I’m on the verge of falling behind. We’re moving in 2 weeks. Moving our entire lives. 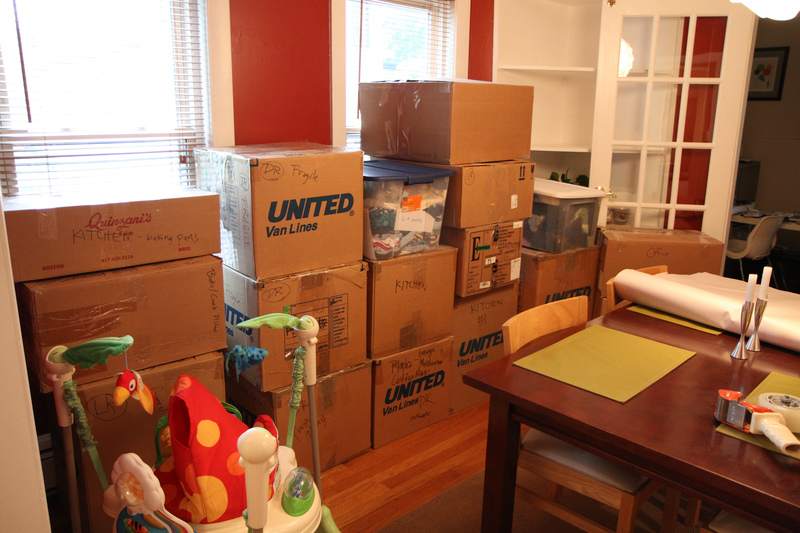 Packing every little cup and spoon and toy and towel (oh, and all that crap in the basement) into boxes and putting it on a moving truck. The number of things that need to get done before that day is astounding. Not to mention Benjamin and I both traveling for work at various times and prepping our current house for renters for June 1st. For so long it felt so far away, and now it feels really, REALLY close. I’m not gonna lie… I don’t really have time to be writing this at the moment. I’m just doing my best to keep my head above water as we dive into this next big adventure. In the meantime, I’m still doing my best to be 100% with Owen in the few hours I get to see him on daycare days. That means shutting the computer, leaving the phone in my purse and ignoring the rest of the world while I engage fully with my little cutie pie. It may be short, but it’s my favorite part of the day. I got out the camera last night in an effort to give you some eye candy of my adorable child toddling around with his ride-on walker (found on craigslist and WELL worth the $15 I spent!). Took a few mommy-cam videos and realized that I’d rather just experience these little moments with my own eyes instead of from behind the camera. And now I don’t have enough time to upload/edit them to post them here since I have so much darn work to do. Thank goodness for Daddy or we wouldn’t have any videos at all! So… videos and pictures coming! Also in the works are an updated About Us page and some other fun changes to the blog. You know… when I find some free time.